Summary: The big game against Army is the climax of this book, but there’s a long story to be told before that. Jim Thorpe, like so many other Indian children, was sent to boarding school, where he was forced to have his hair cut, wear school-issued clothing, and stop speaking his native language. After running away from a school in Kansas, his father sent him to the Carlisle Indian Industrial School in Pennsylvania. He excelled at all sports there, becoming a football and track star and winning a couple of gold medals at the 1912 Olympics. Later that year, Thorpe and the Carlisle team traveled to West Point to play against a team that included Dwight Eisenhower and three other future generals. The symbolism of the future Army soldiers versus the Indians was not lost on anyone as the Carlisle team played a new kind of football created by coach Pop Warner and won the game 27-6. Includes additional information on Jim Thorpe, other members of the Carlisle team, Pop Warner, and the Carlisle Indian Industrial School, as well as a glossary and a list of additional information sources. 40 pages; grades 3-6. Pros: So many people (including me) know Jim Thorpe mainly as the guy who lost his Olympic medals for playing semi-professional baseball, but there is so much more to his story. This is a good introduction to Thorpe, the Carlisle Indian Industrial School, Pop Warner, and the early days of football. Cons: Due to the picture book format, a lot of the more interesting (and in some cases, horrifying) details are omitted. 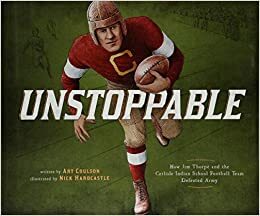 For a more comprehensive picture, read Steve Sheinkin’s Undefeated: Jim Thorpe and the Carlisle Indian School Football Team.